There is void in some of us that make us need to feel loved and liked by others. Some people can function just fine if no one applauds them or approves of them. I, for years, was never that person. I needed the approval of others to the degree that I sometimes made poor decisions trying to please one group, only to realize that I upset another group in the process. Although I had heard the saying “you can’t please everybody all of the time” and knew that it was true, for some reason I still tried. Trying to please people is like being on a merry-go-round, spinning you around in circles and getting you nowhere but back at the spot where you began. As I grew older, I realized that insecurity was the root of my people pleasing. I, like many women, would see the image the media portrayed as beautiful and would compare myself to that. Even though I knew many of those images were not real and were a result of airbrushed pictures, liposuction, implants, plastic surgery, etc, yet I still compared myself. Theodore Roosevelt said, “Comparison is the thief of joy.” It steals your joy because comparison will make you underestimate what you have and overestimate what someone else has. That woman you are comparing yourself to, I guarantee you is comparing herself to someone else. Yesterday our Pastor preached on a scripture that I have heard a thousand times. “For God so loved the world that He gave His only begotten son.” (John 3:16) When I heard the scripture, I thought it would be the usual message teaching us that Jesus died for our sins, but today was different. He titled the message, “For God So Loved Me.” He spoke of the love of God and how no matter what we do God loves, and approves of us. He spoke about how women spend so much money on makeup, hair, nails, shoes, clothes, etc to enhance the outward all in search of significance and approval. Now, I know that there is nothing wrong with enhancing the outward appearance, but none of that will complete you because it is temporal. When you take off the hair, nails, clothes, shoes, handbags etc that same insecure woman will still stare back at you in the mirror. She is not going anywhere and all the makeup and fine clothes, jewelry, and purses in the world cannot make her go away. You have to find your completeness, security and significance in something else. As I listened to the message, I thought about my life. My insecurities came in because of childhood abuse. That abused little girl grew to be an insecure woman who knew how to mask it from the world. No one looking at me, or even close to me, knew my struggle unless I shared my story. Today, I heard a scripture and message that I have heard so many times through fresh ears. Today I received it and settled it in my heart that God loves me and approves of me, and it does not matter what others think. 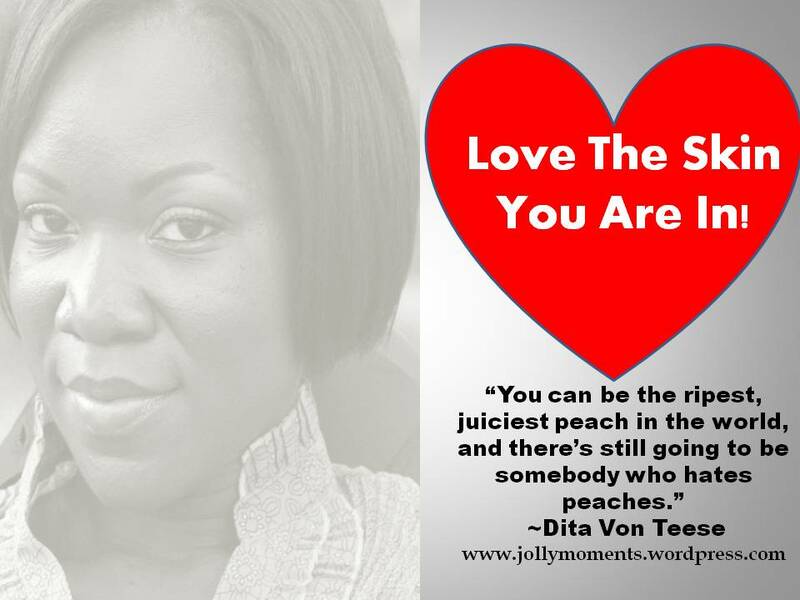 Dita Von Teese said, “You can be the ripest, juiciest peach in the world, and there’s still going to be somebody who hates peaches.” That quote sums it all up. No matter how “perfect” you try to be, there will always be someone who does not like or approve of you. So do yourself a favor and STOP TRYING! I know I am. I purpose from this day forth to love the skin I am in and embrace how God created me. Does it mean I will not have days where insecurity creeps up or the temptation to compare creeps up? No, those days and moments will still occur. The difference is that I will not fall victim to those moments, and will hold my head up and recognize the jewel and the beauty that God created when he created me. I will not believe the lie that someone else is better than I am. They may be different, but it doesn’t’ make them better. “One thing I can do better than anyone else is be ME.” No more comparison, I am just striving to be the best me I can be. One definition of unique is “having no like or equal; unparalleled; incomparable.” There is only one you. There is only one me. That makes us unique and incomparable. That makes us beautiful just the way we are! Thank you so much for this message today. This is exactly what I needed to hear today. Hi Shonika! You are very welcome! I am thankful this message was encouraging to you. It’s always my prayer that what I share here is blessing to someone.